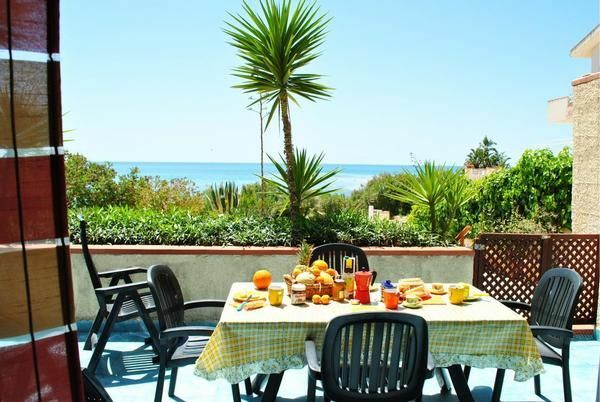 Very attractive and cosy holiday home with independent flats mq 60, only 50 mtr from the beach, with sea view, terrace, barbecue and street parking. Free WI-FI connection. - Pet: per pet and week Costs amounting to 20 EUR (optional). (once per person, vorhanden 5 EUR). Air condition (per property and day, included in price 5 EUR). Bed linen (once per person, vorhanden 5 EUR). Cot (per person and week, according to consumption 20 EUR). Cot for adults (per person and day, to be done by tenant 7 EUR). Intermediate cleaning (per property and day, included in price 0 EUR). Parking facilities (per property and day, included in price 0 EUR). Towels (once per person, vorhanden 5 EUR).